Colonial Savings, F.A. 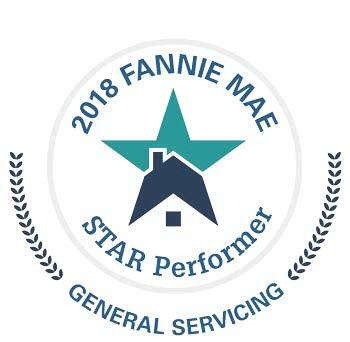 has again been named a Fannie Mae STAR™ Performer in General Servicing for 2018. Fannie Mae’s Servicer Total Achievement and Rewards™, or STAR™ Program, recognizes those who have demonstrated best practices in a number of servicing categories including a review of relevant people, strategies, processes and applicable metrics. This award comes on the heels of the launch of Colonial’s Mortgage Services’ new state-of-the-art website that is designed to make it easier than ever for Colonial customers to make a mortgage payment, access FAQs, schedule automatic payments and more. Founded in 1952 as Fort Worth Mortgage Corporation, today Colonial is a national, multi-service financial institution headquartered in Fort Worth, Texas. A federally charted thrift, Colonial is one of the largest servicers of residential mortgage loans in the United States, with a servicing portfolio of $26 Billion. Colonial operates three mortgage origination divisions, Colonial National Mortgage, a leading retail mortgage lender; CU Members Mortgage, which provides mortgage services credit unions nationwide; and Community Bankers Mortgage, which provides mortgage origination and servicing to community banks as well as a network of eight consumer/commercial banks located throughout North Central Texas. It is also affiliated with Colonial Life Insurance Company of Texas, DuBose & Associates Insurance and Colonial Lloyds. The privately held company provides a full array of personal and business financial products and originates approximately $1.5 billion in FHA, VA, Jumbo, conventional, condo and innovative single close construction loans annually. For additional information, please visit GoColonial.com.